Couples often can agree to the division of their property and finances and matters related to their children. When this occurs, parties often elect to prepare a Binding Financial Agreement or if they want the Court to sign off on their agreement, by making an application for Consent Orders. A Binding Financial Agreement is a private agreement which can be entered into before, during or after the relationship has ended. It acts much like a private contract between parties and does not involve a Courts approval or intervention, or registration by any other external body or authority. 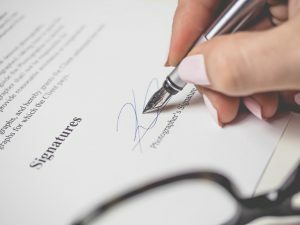 However, if you and your spouse wish to enter into a Binding Financial Agreement, you will both require your own independent Family Law solicitor to sign off on the agreement. A Binding Financial Agreement made before you commence the de facto relationship or marriage is more commonly known as a prenuptial agreement in the US. If you are thinking about getting married or moving in with your partner, you should consider a Binding Financial Agreement. It is not pessimistic or opportunistic to turn your mind to these things at an early stage and can save the parties the stress and anguish of trying to resolve these issues at the end of a relationship. It is a realistic and practical way of managing your financial affairs with your spouse with the hopes that you will never have to rely on the agreement. Much like taking out health insurance, a Binding Financial Agreement is a preventative measure and can provide asset protection at a time when emotions run high. If you and your spouse have come to an agreement with respect to the division of your property and finances, a good idea is to speak to a Solicitor about registering your agreement with the Family Courts by way of Consent Orders. This can be done without the need to go to Court and will make your agreement legally binding and will give you the protection and security that you need moving forward. A Consent Order is a written agreement made between spouses which are approved by the Family Court. Generally, a party will discuss and negotiate the orders amongst themselves, or through their Solicitors, and once the orders are agreed they then make an application to the Family Court to approve the orders. In parenting matters, whether it is “in the best interests of the child”. Once the orders have been made through the Family Court, they have the same effect as a Court order made by a Judge after a Court hearing. This means that if either party breaches the Court orders without reasonable excuse, they could be given a warning for minor breaches or even ordered to pay compensation, a fine, or even imprisoned for a more serious or repeated breach. Consent orders generally deal with the transfer or sale of matrimonial property, the splitting of superannuation, and child maintenance and spousal maintenance. They can also be used to vary or discharge existing family law orders. How long do I have to make Consent Orders? Applications for Consent Orders can be filed at any time after separation but should be filed within 12 months of a divorce, or 2 years of the breakdown of a de facto relationship. If you are seeking financial or property orders after these time frames, you will need to seek the Courts permission to make the application. If you have been discussing a proposed agreement with your partner and would like some guidance on the types of orders you could seek, or assistance in determining what is ‘just and equitable’ within a family law context, we invite you to contact the Rockliff Snelgrove Lawyers Family Law department conveniently located in Sydney CBD.